In 1989 Sensei Stringfellow began training in martial arts and Gymnastics at 19 years old. 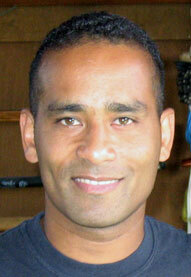 Sensei Stringfellow has over 23 years of training in martial arts. He has studied Tae Kwon Do, Sho Rin Ryu Okinawan Style Karate, Lon Fu (a mixture of Karate and Kung Fu), Jujutsu, Aikido and the Marine Corps Martial Arts System. He trained in Northern California with Shihan Larry Gregg in the Bujinkan Martial System until joining the United States Marine Corps in 1993. While stationed at El Toro MCAS in Irvine, Sensei Stringfellow began training with Shihan Kyle Hayes at the Bujinkan OC Dojo in 1995 starting over again at the rank of white belt. Sensei Stringfellow was a Communications and Navigation technician on C-130’s and achieved the rank of Sergeant before being honorably discharged. 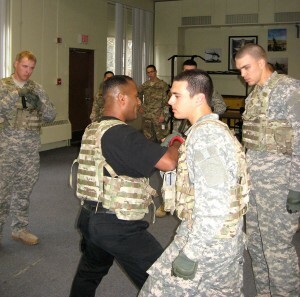 Sensei Stringfellow is in the field of Executive Protection and has been for the last 8 years. He also assists as a Fugitive Recovery Agent and has since retired from being a gymnastics instructor for over 21 years. Sensei Stringfellow is a member of International Bujinkan Dojo and was promoted to Assistant Instructor in May 2004 at rank of 1st Degree Black Belt (Shodan) while in Japan. He was awarded Title of “Shidoshi (Teacher of the Warrior Ways)”with Instructors license after passing the 5th Degree Black belt (Godan) test in May of 2007 while in Japan. Sensei Stringfellow is currently a member of the Shidoshi-Kai (Instructors Guild) headed by Dr. Masaaki Hatsumi the “Soke” (Grandmaster) of the tradition. Sensei Stringfellow takes his direction from Kyle Hayes Sensei directly. Sensei Stringfellow travels to Japan with Kyle Hayes Sensei to train with Hatsumi Sensei and the other Shihan when his schedule permits. Sensei Stringfellow trains with Sensei Kyle Hayes on a regular basis going to his instructors training course held every 3 months at Sensei Kyle Hayes’ dojo in Orange County in the city of Mission Viejo. Sensei Kyle Hayes is a Master Instructor and holds the rank of Jugodan (15th Degree Black Belt). He is the 199th in the world to earn this title. I would like to take this time to thank Sensei Hayes for all that he has done for me, for his mentor-ship and consistent drilling that points me down the warrior path I travel today. Training is at the Platinum Sports Center.